Let’s not hide any relationships, Aero Precision is a site sponsor and through this sponsorship I received two Ballistic Advantage barrels for review. A lot of the stuff you see on the blog is on my dime. The M4E1 upper that I love was on my dime. The Ultralight scope mount was also my dime. Razor HD? My dime. Lots of my money is tied into the equipment you see on my blog. That said, any gear I get for free is legitimately reviewed and there are no “deals”. My blog is independent, and I have a day job, ergo I don’t write glowing reviews to ensure a paycheck. That said, my goal is always a fair and honest review. This Hanson barrel and its Nitrided brother were sent down earlier this year for a photo shoot and here they are now ready for a review. First up, the BA Hanson. I feel that the only way to actually review a barrel is to follow it for a long time, over many rounds, in many circumstances. Hence forth, we begin the Ballistic Advantage Hanson review. My Hanson barrel is a 16 inch, 1/8 twist, bead blasted, 416R stainless steel, 5.56 Wylde chambered barrel with a target crown. The Hanson series barrel is a premium offering from Ballistic Advantage and this model commands a price of $245 online with a low profile gas block included and pinned in place. When I received the barrel for a photo shoot, I was very satisfied with the fit and finish. 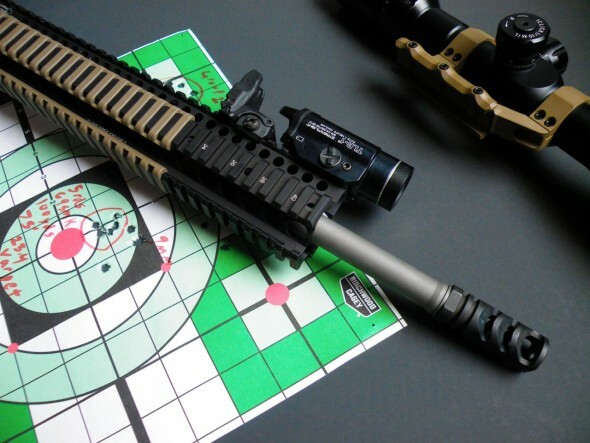 The receiver extension is a slick assembly with m4 cuts and a nickel coating from Fail Zero. The bead blasted finish was flawless and the target crown and threaded barrel was clean and well made. As soon as I got to Texas, I began to build the rifle that would host the barrel. I got home, grabbed the AR15 I left in Texas 7 years ago, and removed the old barrel and installed a Larue 12.0 and the BA Hanson. The first range session was a no drama affair. I chambered both hand loaded 69 grain SMK and AE223J 55 grain ammo. I sighted in at 100 yards and threw on a 14X PA optic for accuracy testing. I went through 100+ rounds for a casual range session with the rebuilt rifle. I was using a standard carbine buffer assembly, and experienced no jams, double feeds, or failure to fire. I was using Magpul PMAG30 round magazines. Overall, I can say simply that the first range test resulted in smooth operation and nothing was amiss. Coupled with the M4-72 muzzle brake, the assembly had so little recoil that I was honestly shocked. I ain’t never had no 5.56 rifle kick so little, but that’s the power of the M4-72 and a properly built rifle with a mid-length gas system. This gun is going with me to a carbine competition. Ballistic Advantage Hanson in center. Fit and finish ranks as excellent. My best group was 5 round group that landed in center to center at 3/4 inch, and this was accomplished with 69grain SMK. I accidentally left my 75 grain reloads at home, which is the load I wished to test the barrel with, but that will be next trip. That was an impressive group. Why is there a 9mm hole next to a 100 yard group? Because the Glock 17, six second mount, and red dot can reach that far, duh. I had another not so impressive group that ran just a bit over an inch, but right now nothing is set in stone as far as my perception of the barrels ability. With another range session and my 75 grain match loads, I will be shooting multiple ten round groups to see just what this barrel and I can do. Hopefully the 75 grain and Varget loadings that shot so nicely in my Criterion will offer great performance out of this barrel as well. Blech… I can’t blame the barrel for this group. Not that that’s a bad group anyway since just over an inch would hit a man-sized target as far as the AR is capable of, but I post this to ensure to you, the reader, that I am not running a paid “review” of this product. It’s real here yo! Just like normal people I can whiff it just like you can! Off to a good start. Barrel works. That’s important. Barrel is reliable. That’s important. Barrel offered me a hint of its potential, and that potential is pretty captivating for a light weight, accurate build. There are a lot of good products on the market, and in the highly competitive barrel market, it’s hard to tell which product to go with. Boil it down to this: price, customer service, and features. If the design philosophy of the BA Hanson series suits your budget and fulfills your needs as a shooter, put it down as a contender for your money. Next range trip I will be doing much more comprehensive accuracy testing. We will see how this unfolds over the next few months. Follow the BA Hanson here. Atibal XP8 Review: Budget Done Right! What happened to the promised follow up reports that were going to happen over the “next few months”? I am considering one of these barrels. I would have loved to see what you thought long term! I don’t believe I used the word “promise” but I have had a variety of fun activities on my plate, not all of them related to the blog. I still have the barrel, and I happen to be working on 5 loadings for testing another product. Until then, please see the data from scienceofthegun which I cited in my lead article which tests a BA, Criterion, and Larue barrel. I apologize if I came across as demanding or something! My intended fake sarcasm did not come across very well and my choice of words was probably not good. I appreciate your review. I also just read the other post you referred to (and the links it provided as well). They were very helpful too. I have found a good deal on a used BA barrel that I think I will get based on this info. Thanks! ← Trijicon TA47 On Sale at Midway!